The issue of measurement is of fundamental significance in quantum mechanics which is applicable for the rather provocative title “How the Result of a Measurement of a Component of a Spin- Particle Can Turn Out to be 100″,1 of a paper published by Yakir Aharonov, David Z. Albert and Lev Vaidman (AAV) in early 1988. In this paper AAV propose what they call a “new kind of quantum variable” which they gave the unique name weak value. Suppose an object system S, on which a Hermitian operator shall be measured and a probe system P (often refereed to as ancilla and sometimes measurement device). An important point is that both are considered being quantum systems, as illustrated below left. The weak measurement procedure involving three steps: (i) preparation of an initial quantum state of the object system S, this is called pre-selection. (ii) a weak coupling of this system with a probe system P, with initial pointer state , via a coupling Hamiltonian . The initial state of the probe system P is supposed to be of Gaussian type (with initial spread ), having a q- and a p-representation given by and , respectively. The observables is the canonical variable of the probe system, with conjugate momentum and is a function with compact support near the time of the measurement – normalized such that its time integral is unity. The interaction is supposed to be sufficiently weak, so that the system S is only minimally disturbed. Using the spectral decomposition of the initial state in eigenstates of , given by and (eigenvalues ). 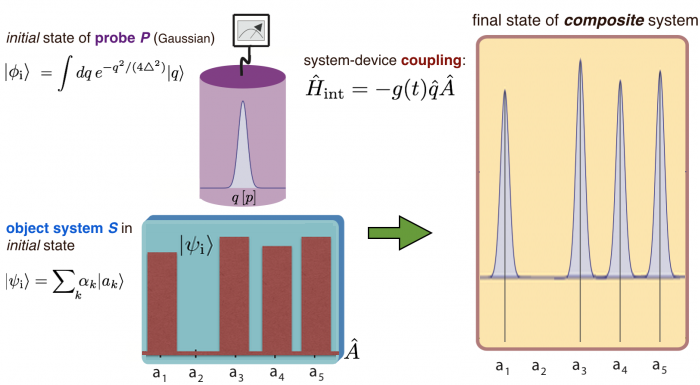 The time evolution of the composite quantum system, consisting of both the object and the probe system is given by . Evaluating this expression yields an entanglement of probe and object system expressed as , which is a superposition a Gaussians (with width ) peaked at the eigenvalues . The probability distribution of the pointer states is given by . For this expression describes a usual strong measurement having the following three properties: i) the only possible measurement results are eigenvalues , ii) the probability of the outcome is given by the squared amplitude , iii) if the measurement yields system left in the eigenstate . But what happens when the initial state of the probe system is broad ? In that case, instead of many peaks, we end up with a single peak , centered at the usual expectation value of given by . If a strong measurement of an observable is performed in addition, the system in put in an definite final state , which is , which is orthogonal to the postselected finial state and therefore . Thus in this case the final measurements cannot find the particles in the state and therefore, the only cases in which the final measurement can find the particles in the state are those in which the intermediate measurement found that particles 1 and 2 are in different boxes (paths). See here for our neutron optical experimental demonstration of the quantum pigeonhole effect. being the real and imaginary part and the modulus of the weak value of the Pauli operator , holding for all values of . See here for our neutron optical experiment studying weak values obtained at arbitrary measurement strength. In 2011 a novel direct tomographical method was presented 6 which made it possible to determine the quantum state without the need for post-processing, as it it the case for quantum state tomography (see here for details on tomography). The basic principle of the direct measurement of a quantum state is the following: general representation of a state vector is given by , with eigenstates and probability amplitudes . If we now calculate the weak value of a projection operator onto an eigenstate we have the usual expression . Pluggin in the definition of th eprojection operator from above we get , where the deninition of the probability amplitudes occours and after rearranging the terms we get an expression of the probability amplitudes in terms of weak values . For the complete state vector we nowhave the expression . See here for our direct measurement of the neutron’s path state in the interferometer. In the original framework of weak measurements, as developed by Yakir Aharonov, David Z. Albert and Lev Vaidman (AAV) 1, the formula for the weak value only applies to pure initial and final states, and even more important here, with weak measurement strength. Naturally the following question arises: “Is the weak value expression still operationally meaningful for impure boundary conditions and arbitrary strength measurements ?” This question was addressed in by Andrew N. Jordan and Justin Dressel by introducing the concept of contextual values of an observable, as a generalization of its eigenvalues that take into account the details of the specific measurement procedure 7. However, the term has caused confusion with the unrelated concept of contextuality as it applies to hidden variable models of the quantum theory. We therefore referre to these values as generalized eigenvalues. Even for non-projective measurements one may still assign meaningful values to imperfectly correlated detector outcomes—that is, averaging carefully chosen values can recover the correct expectation value as an ensemble average, but the needed values are generally not eigenvalues. This equivalence under the averaging process can be expressed more formally in terms of an operator identity, , where are the eigenvalues of with eigenstates and are contextual values for with respect to a particular positive operator-valued measure (POVM) , satisfying (see here for an introduction towards POVMs). It can be shown how conditioned averages of generalized measurements converge to the weak value as a stable limit point when the measurements become sufficiently weak 7. For purity-preserving measurements such that the POVM elements factor into single Kraus operators , a general conditioned average of generalized measurements in between an initial mixed state and a final generalized measurement POVM will have the form ,where the perturbation away from a generalized weak value expression is determined by Lindblad decoherence with . 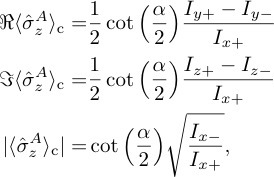 In the case of a weak measurement, , the commutators in the Lindblad disturbance approximately vanish, leaving the weak value expression as the conditioned average. Evidently from this analysis, it is clear that any situation in which the Lindblad disturbance can be made irrelevant in the numerator will be able to recover a generalized weak value as an operational average, up to renormalization. It thus becomes interesting to consider special cases where stronger measurement strengths with less statistical uncertainty can recover the weak value expression without any approximations. See here for our experimental study of generalized eigenvalues in an neutron interferometric experiment.